This is a special release that is currently only available to subscribers.You can get it free with any subscription that includes 1001 Nights, see the Big Finish site for details. It features the Fourth Doctor and Leela who are also featured in series 1 of the Fourth Doctor Adventures. On an island observatory several scientists track a strange form that circles the earth at night. They send off a pulse to try and contact the object. The Fourth Doctor and Leela are aboard the Tardis observing Earth from space. The signal causes them to crash. When they leave the Tardis they find a dead security guard. What is the Stormcrow and why is it attacking the observatory? This is a claustrophobic tale with some interesting ideas that I don't feel made enough of an impact. The performances are fine and the creature is truly terrifying, but the script doesn't give enough focus on those aspects. The Fourth Doctor has some great lines, but generally ends up solving one problem after another right away. He doesn't seem too worried and if there's one thing we've learned, it's to trust the Doctor. When he is put out of action near the end, it isn't given as much weight as it should have been. Leela gets more development! In my favorite section, that should have been focused on more, we get some introspection about Leela's hopes and fears. The true darkness in the feelings of this often comical character is something that I hope we get much more of in the future of the series. There is a section where Leela catches a case of the stupid for plot convenience that really annoyed me though. Director Peggy Brooks is a big b^tch. She's in charge and won't let anyone forget it. Actress Chase Masterson certainly brings as much as she can to this limited character, but I found myself wondering why she was there most of the time. Professor Gesima Cazalet is an heiress who discovered Stormcrow. She has developed an unnatural fascination with the beast that drives the end. The No-things are an awesome foe with a great concept. Sadly, they don't come off as threatening as they really should have. They fail to be scary despite their abilities, probably because the Doctor just knows their weakness offhand.. They have awesome power and I think it would be cool to see them back in a future story. The Stormcrow is another effective entity that comes off as more typical than it should. It reminded me a lot of the X-men's phoenix force (comic version). The small island and the observatory are a rather bland setting. They do a lot with the isolation, except the Tardis is always on hand and even helps out! Now, this does lead to a later plot development, but that wasn't handled as well as it should have been either. The end was pretty standard, complete with spooky cliffhanger. I honestly found the trailer for series to of the Fourth Doctor Adventures to be the most exciting thing about the end. I think the main problem is the lack of tension created by the Tardis being available the whole time. Also, much of the drama is created by human stupidity, which is fine, but I don't want that transferred to say, Leela. I know I've been particularly harsh on this one because I was expecting a lot more than just a good audio It has its high and low points that balanced each other out. It is definitely worth a listen with the fantastic Fourth and Leela, but it doesn't stand out against some of the other great stories. 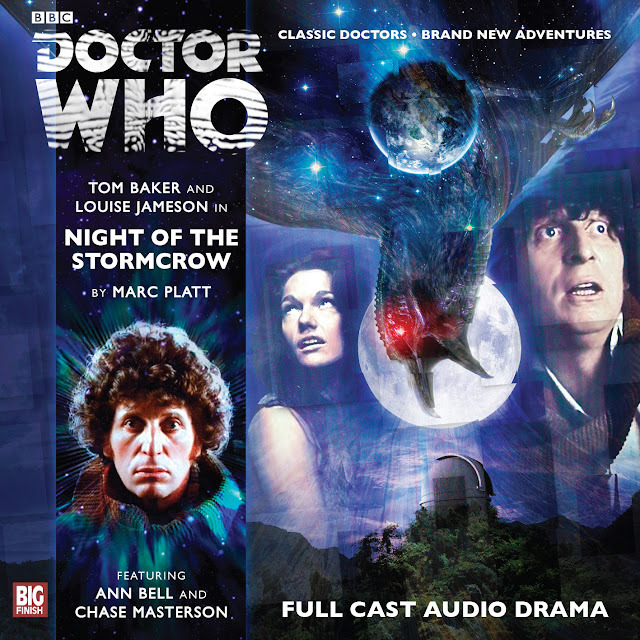 Buy it here from Big Finish!